Yesterday, Delta Xi Phi celebrated its 16th anniversary. On April 20, 1994, 15 University of Illinois, Urbana-Champaign students unveiled a sisterhood that continues to break barriers and make connections. Reflecting on this led me to think about my journey towards DXP sisterhood. 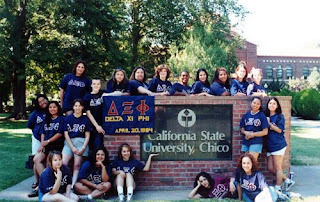 In the Spring of 1999, I was a new mother, as well as a full-time student continuing my studies at California State University, Chico, was an active member of the Filipino American Student Organization, and had a part-time job on campus. 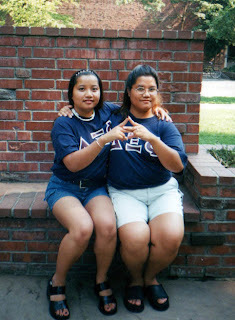 My older sister, Cyndi, had joined Delta Xi Phi in the Fall semester, but it never dawned on me that I could join a sorority. This is something that I’ve heard from many a DXP sister throughout the years – “I never would have joined a sorority.” or “I didn’t fit in with the sorority stereotype.” So when I was invited to start the DXP membership process, I felt like the women of this chapter saw past my challenges, and saw potential in me that I couldn’t see. I also have great respect for my sister Cyndi and thought that if she was passionate about DXP, it must be a good thing! On May 3, 1999, I crossed as a Delta Xi Phi sister with 3 other phenomenal women as the Gamma line (Les Bleu) of Beta Associate Chapter. At the time, only 3 chapters existed in 3 states! DXP had only been a national organization (chapters in more than one state) for 6 months! I was the last of the single digits at Beta! It’s all so amazing to me. I had a “sister-squared” – Cyndi (we’re pictured above). Being an active sister at Chico State was a learning experience! We were a small chapter compared to the other cultural greeks, but we were involved in so many events, committees and groups. We even planned National Convention 2000 (pictured below). Serving on the National Board from 2002-2008 was a gift. I was given the opportunity to get to know and learn about so many exceptional women. Seeing the fire in their eyes, helping them achieve their dreams and build this sisterhood taught me a plethora of skills and gave me such priceless experiences. One experience that has stayed with me happened when I was Expansion Chair and visiting our University of Alabama, Tuscaloosa colony. Experiencing first-hand just a pinprick of the discrimination our sisters in the south had to overcome, opened my eyes to the reality of why DXP is so important. Coming from California, diversity was a norm for me. I was humbled, and I will never take it for granted again. We’ve built the national sisterhood from the ground up – from our founders and first sets of national boards to the present. I am proud of what we have achieved, and look forward to the amazing endeavors DXP sisters will pursue!